After publishing their initial iPad Air 2 review last week, the guys from Anandtech have decided to do what they do best: take the device under their “microscope” and see why the iPad Air 2’s SoC performs so well. And what they found under the hood surprised them. 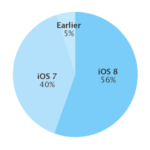 You may already know that the iPad Air 2 is powered by the A8X chip – Anandtech calls it the GXA6850. The iPhone 6 and 6 Plus are powered by the A8 chip manufactured by TSMC, and labeled as GX6450 by Anandtech. 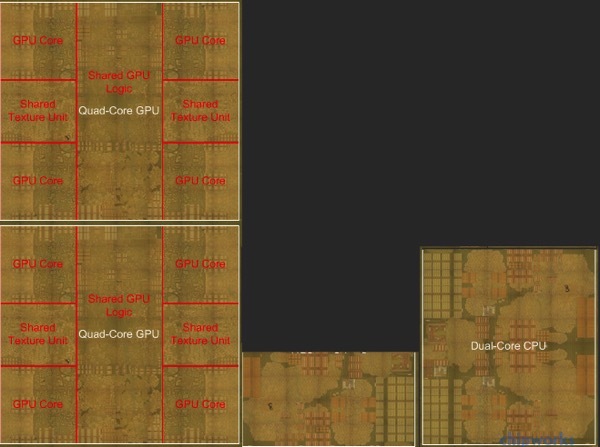 When Apple detailed what the iPad Air 2 is capable of, Anandtech was certain that Apple was using Imagination’s PowerVR GX6650, the largest of the supplier’s GPU designs. However, a deeper analysis revealed that the A8X GPU is much more powerful than the aforementioned GX6650. However, multiple clues suggested that there is a twist in the “story”: first, there was the Imagination announcement of its next-generation PowerVR Series7 GPUs, revealing that an 8-cluster design was possible. Secondly, the GFXBench 3.0 data highlighted that the Air 2 chip has double the performance of the A8 found in the iPhone 6 Plus. The final piece of information came from the die shot of the A8X, which confirmed what the Anandtech experts suspected: the chip found in the iPad Air 2 has an 8-cluster Series6XT configuration. While Apple licenses PowerVR GPU cores, not unlike their ARM IP license they are free to modify the Imagination designs to fit their needs, resulting in an unusual semi-custom aspect to their designs (and explaining what Apple has been doing with so many GPU engineers over the last couple of years). In this case it appears that Apple has taken the GX6450 design and created a new design from it, culminating in an 8 cluster Series6XT design. Officially this design has no public designation – while it’s based on an Imagination design it is not an official Imagination design, and of course Apple doesn’t reveal codenames – but for the sake of simplicity we are calling it the GXA6850. You can read all the details on Anandtech’s website.